What you've asked for has finally arrived! Kai Eau de Parfum. The bottle is crafted from French glass and boxed in signature clean kai packaging. The eau de parfum epitomizes the pure philosophy of kai: breath, life, flow. 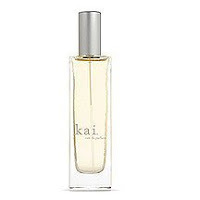 Kai is an intoxicating blend of tropical gardenia and white exotic flowers. Why the wait? "We wanted to wait until we found the right balance of ingredients for our first eau de parfum,” said Gaye Rappaport, founder and chairman of kai. “With this new release, we were finally able to capture the signature kai scent in an eau de parfum spray that customers have been asking for. Finding the right balance between the fragrance and the other ingredients is so important in a spray. We didn’t just want another eau de toilette; we wanted an eau de parfum that embodied the subtle nature of our signature perfume oil. It took a while, but we’ve finally gotten it right.” The bottle is crafted from French glass and boxed in signature clean kai packaging. The eau de parfum epitomizes the pure philosophy of kai: breath, life, flow.